Adswood is a suburb of Stockport, Greater Manchester, England. The name is said to be derived from "Adders wood"; in the reign of King Charles, the area was royal hunting grounds with a large population of snakes. Adswood has its own coat of arms, a snake wrapped around a tree. Council housing in Adswood began in the 1920s with the building of Culver Road at the back of the estate towards neighbouring Cale Green. The rest of the housing was built in the 1930s and 1940s. In 2016 building started again in the north east corner. Before this, a farm stood on the land. The area benefits from lots of green spaces including a football pitch. ^ Ordnance Survey: Landranger map sheet 109 Manchester (Bolton & Warrington) (Map). Ordnance Survey. 2014. ISBN 9780319231555. Wikimedia Commons has media related to Adswood. 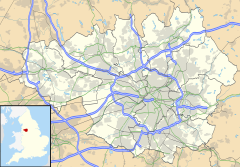 This Greater Manchester location article is a stub. You can help Wikipedia by expanding it. This page was last edited on 2 October 2018, at 05:43 (UTC).